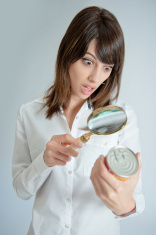 This is a great question from one of our readers…how do I read a nutrition label? We all know nutrition labels are important and that we’re supposed to read them, but reading them and understanding them are two totally different things. And, a lot of what we think we understand, may not be as clear as we think. Food labels are regulated by the FDA and are a required element on most food packaging. There are specific items all food labels must contain such as the contact information for the manufacturer, an ingredient list, and a nutrition facts panel. But, don’t let this fool you. Individual food labels are designed by the company that sells the food item. What’s that mean for them? Free marketing space! Have you ever seen bold writing on a label indicating something such as “all natural” ingredients? That probably made you think this was a healthier product, right? Well, actually wrong. Phrases such as “all natural” on a food label are just health claims, which aren’t regulated by the FDA. Unfortunately, food companies can add these claims to their packaging without any real evidence to back them up. According to the FDA food label guidelines, a term like “all natural” means absolutely nothing. In addition to misleading health claims, the nutrition facts panel itself wasn’t designed to be easily understood by the untrained person. First of all, all the percentages and stats are based on a 2000 calorie diet. We’re all individuals and a 2000 calorie diet IS NOT a one size fits all amount, it’s an average. Most of us need more or less than 2000 calories per day. This is not the worst of it by far though. What’s the most misleading item on the nutrition facts panel? The serving size information. Serving size is another thing that isn’t regulated by the FDA. What’s that mean? Each food company can decide how much of a food item to consider a serving and they use this information to their advantage when creating the food label information. Go ahead…take a look at one of the prepackaged meals in your freezer or a canned food item (like soup). I bet there’s at least 2 servings in that container. Do you ever eat those items as 2 individual servings? No, probably not. You’re eating the whole container because what’s considered a serving, according to the nutrition facts panel, wouldn’t satisfy you. Well, if you’re eating the whole package (or both servings), you need to multiply everything on that nutrition facts panel by 2 because that’s the portion you’re really eating. Two times the calories, two times the sodium, two times the sugar, and so on. How healthy is that food looking now? 1. Don’t just look at the total number of calories in a food. It’s also important to see how many of those calories are from fat. Depending on the food item, you usually want this number to be low. 2. Avoid items that contain trans fats. Trans fats are created through a process called hydrogenation. This process makes unsaturated fats act like saturated fats and are found in many prepackaged, processed food products. 3. If an item contains 20% or more DV of a particular nutrient that’s considered a high amount of that nutrient. DV means ‘daily value’ or how much you should consume in a whole day, not just when eating that one item. The only nutrients you should consider healthy at or above a 20% DV level are fiber or any of your vitamins. 4. An item is considered to be low in a particular nutrient if it’s at or below 5% of the DV. You definitely want to see nutrients such as sugar, sodium, cholesterol, and saturated fat below 5% on any one particular food item. These are the nutrients that always tend to be high on prepackaged, processed foods. 5. Read the ingredient list. More ingredients listed equals a more processed food item, especially if there’s a long list of ingredients you can’t pronounce. Unfortunately, there a lot of ingredients allowed in food products that you may not want to be eating. There’s also a lot of names for sugar or sugar substitutes- the biggest addictive substance in our food and a post for another day! Great health really starts with being educated and mindful about what you’re putting in your body. Food is fuel. You wouldn’t put the lowest grade of fuel in your race car before heading onto the track, don’t put energy depleting nutrients into your body. Always choose foods as close to their natural state as possible, think fresh fruits and vegetables with no complicated label to understand. When that isn’t possible, make sure to be an informed consumer and always read that nutrition label to make sure the food you’re eating is really what it’s advertised to be!